A perfect choice for a cruise shore excursion, this ATV tour is available to everyone, even Carnival passengers! 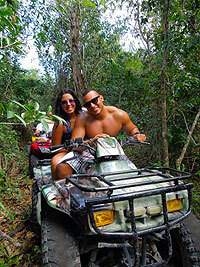 Drive your own fully automatic ATV through the narrow jungle paths of Cozumel's wild interior jungle. We will ride the best off-road paths in Cozumel, getting down and dirty! The cruise ship excursions stay on the beaten path, we'll get off of it. We'll also visit an ancient Mayan ruins site and learn about this fascinating culture. After the ATV Tour, we'll head to a beautiful beach resort, where we'll enjoy a delicious lunch with Mexican fajitas. Then you can relax and enjoy the facilities for the rest of the day, including lounge chairs, umbrellas, swimming pool, restaurant and bar. The beach resort is only a short walk from most cruise piers, so it's a very convenient way to spend the rest of your day! Drive your own ATV through jungle trails and the best off-road paths in Cozumel! Explore ancient Mayan Ruins, preserved through the ages! Visit a beautiful Beach Resort, where you can eat lunch and use all the facilities the rest of the day! When: Three Times Daily at 8:30 AM, 10:30 AM and 12:30 PM. Where: Meet at El Cid La Ceiba resort, a short walk from the Puerta Maya and International Cruise Piers. How Long: 3.5 Hours approximately. You can stay and use the beach resort facilities as long as you like! Prices are total cost per ATV, not Per Person. Kids: Must be 18 years old with a valid drivers license to drive your own ATV. Ages 8 and up can ride on a shared ATV. Restrictions: Maximum age to participate is 65 years old. Weight limit is 330 lbs per ATV. Drivers must present a valid drivers license. Pregnant guests, or guests with back or neck injuries or recent surgeries cannot participate in this tour.